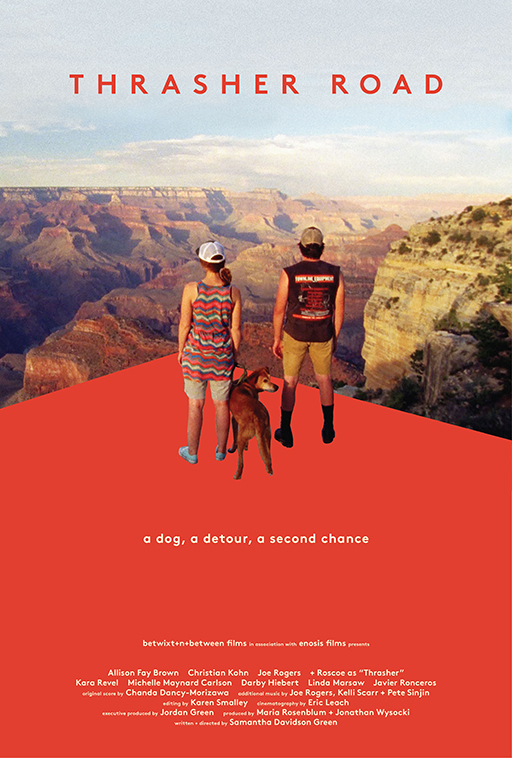 When an accident strands pregnant Chloe and her elderly dog, Thrasher, on the highway home from broken dreams in L.A., unwelcome rescue comes from her estranged dad, Mac, who takes them on a disastrous detour toward a second chance. So many funny, sad, unusual and crazy things happened making this film... For starts, we were delayed starting our desert filming by wild fires in the Santa Clarita mountains around L.A. Our dog trainers, also experts in exotic animals for movies, had to rescue a lion from a burning preserve. The smoke from the fire trailed us eastward, cast an eerie shadow over the sunset scene when "Mac" arrives to rescue his daughter in the desert. Our sound guy coined the phrase: "Hold for the apocalypse!" as the smoke chased us further east to the Grand Canyon, where two hours to shoot the scene on the rim shortened to 20 minutes due to the false western horizon made by the smoke. The frantic director nearly fell in the canyon scrambling to get everyone in place! In Mississippi on the day of shooting the burial in the primordial forest on the banks of the Mississippi, we were swarmed by a mysterious species of butterfly. When shooting the highway scenes, we were swarmed by red ants! Our picture truck, barely road worthy, was so hard for one actress to drive that another character essentially drove it from beside her. And all across America, we packed DP, AC, dog trainer, director, actors and DOG in a Prius. Life imitated art in the making of this film! Writer/director Samantha Davidson Green is an alumna of the Mississippi Teacher Corps. She lived in Copiah Country for 3 years while teaching and got her Masters at Ole Miss. Several of her students, now fully grown, jumped into cameo roles, and blues singer and friend Linda Marsaw performed in the role of Linda in the scenes filmed at Ground Zero Blues Club in Clarksdale, where much of the filmming was done. Our line producer Robbie Fisher and driver Jenni Smith have been deeply involved with Crossroads Film Festival and have spoken highly of it. We are eager to share the film with central and southern Mississippi! Mississippi is the home at the heart of this film. We couldn't have made the film without the support of the Mississippi Film Office, the city of Clarksdale, and many Mississippian. We are excited to share at Crossroads!